Houston drivers suffer second-most expensive commute in the U.S. The holidays are often a mad crush of shopping and wrapping and cooking and visiting. Amid the hustle and bustle of too-much-to-do, not-enough-time-to-do-it, it can be hard to find the wonder of the season, to remember that, for Christians, this time of year is one waiting and anticipation, culminating in a glorious hope of great things to come. For others, it’s still a time of beauty, often laced with nostalgia for a simpler past. Christmas light displays manage to convey all those emotions. They twinkle and sparkle, they accent and shine. They can be joyously sacred or dazzlingly secular. And they can be enjoyed by everyone. So check out our list of where to find great displays to lift your holiday spirits and enfold you in the glad tidings this time of year brings. Walk across the bridge to the stunning mansion once owned by Ima Hogg and you’ll be transported into a winter fairyland. 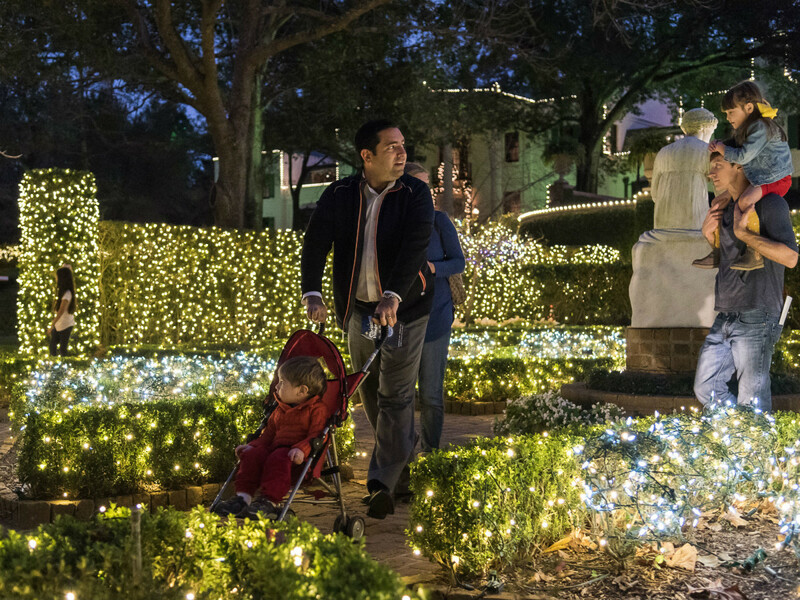 A trail of lights along the mansion’s 14 acres brings holiday magic to this River Oaks enclave. Carolers and faux-snow slide enhance the winter experience and home tours feature actors, theatrical effects and Christmas décor. Tickets for non-members are $15 or adults and $13 for children. 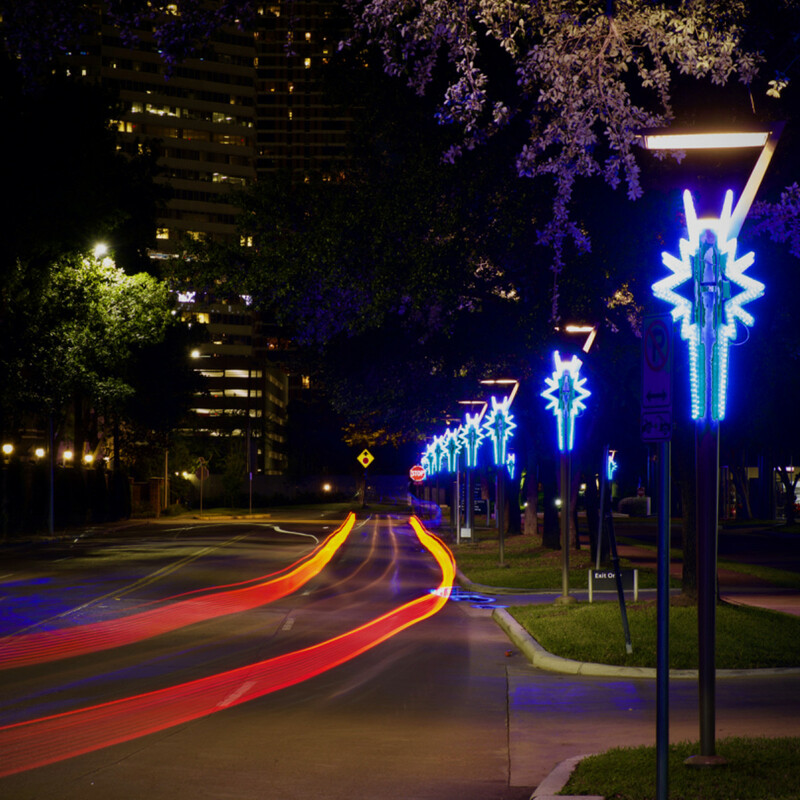 Thousands of lights adorn the streets of CityCentre, adding to the already festive atmosphere of one of Houston’s most popular shopping and dining destinations. As you stroll through the big-name national stores and smaller, locally owned businesses, take stock of the twinkle and fun around you. 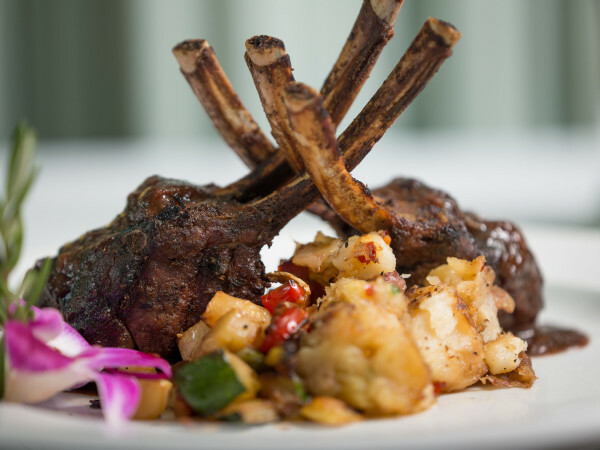 When it comes to getting into the holiday spirit, it’s hard top this beloved Galveston venue. Its annual Festival of Lights is a mile-long display with more than a million lights creating holiday tableaux. In addition to the lighting displays, there’s an ice rink, 3D films, train rides, photos with Santa, and myriad holiday festivities. Check the schedule for all that’s available. 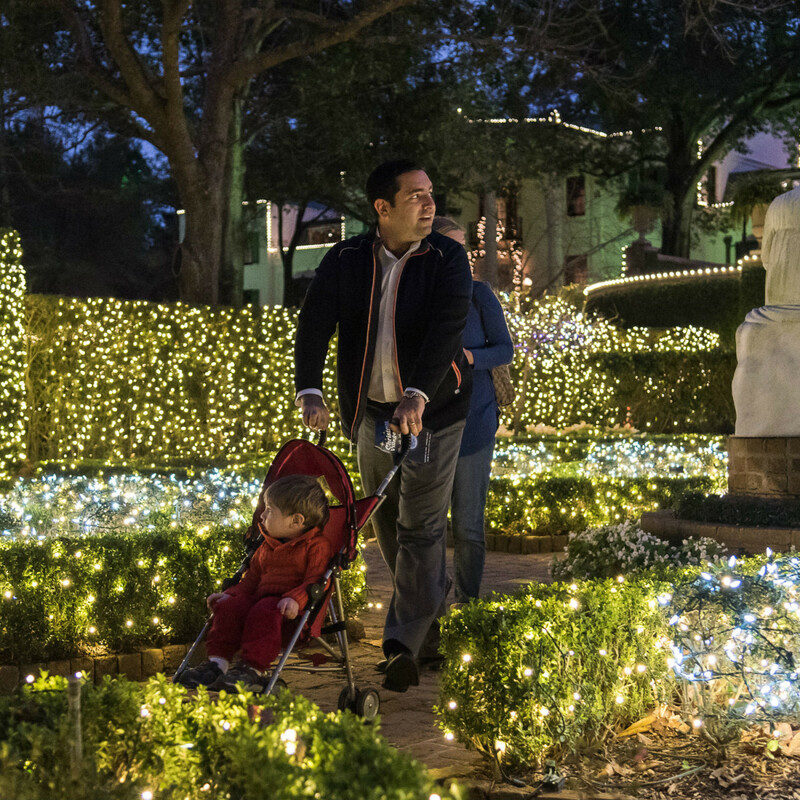 The Festival of Lights opens nightly at 6 p.m., through January 6. Multiple ticket packages are available, with single tickets for the Festival of Lights starting at $15.95. 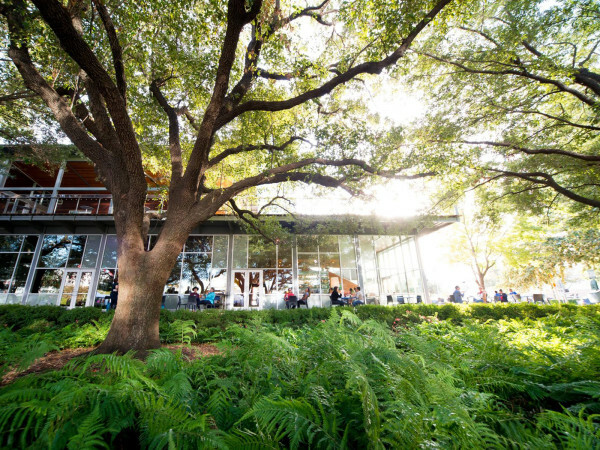 Houstonians and visitors from far and near alike know the massive mall is a must-see Houston destination. That’s doubly true this holiday season, with the addition of a 55-foot-fall Christmas tree in the lower-level skating rink. It’s lit by 450,000 twinkling lights and the tree’s 1,000 branches were all hand-fluffed and then decked with more than 5,000 ornaments. If you stroll along Westheimer just about where Central Market is, down toward the swanky River Oaks District, you can’t miss the holiday cheer that adorns one of the city’s go-to shopping meccas. Huge bows sit atop the buildings, white lights encircle the trees, wreaths are hung from doors and poles. Shoppers should take a breath and look up to see the festive setting they’re in, while those cursing the traffic along one of the city’s most-traveled thoroughfares might smile at how brightly beautiful the area is. Looking for that perfect spot for your Christmas picture? The lights here at this downtown hotel make for a brilliant backdrop. Thousands of them sparkle against the granite tiles, and an archway of brightly lit branches plays against the poinsettia-lined walkway into the hotel’s grand lobby. 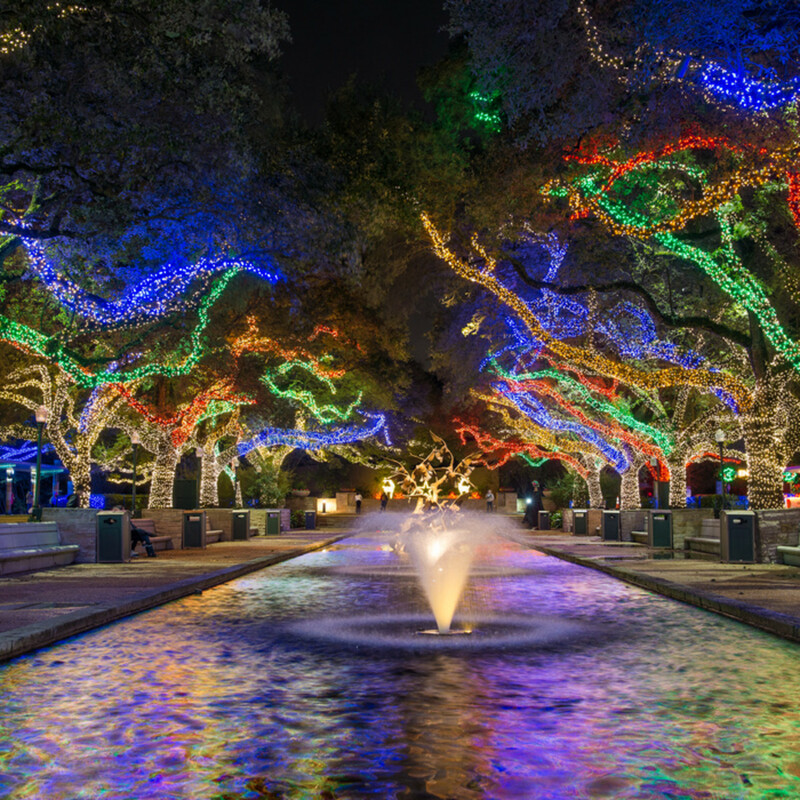 A variety of guided holiday light tours are available, ranging form three to seven hours, taking visitors across the Bayou City. Tour stops include Woodland Heights, Downtown, Midtown, Montrose and more, with stops for breaks and refreshments. This multicultural display covering 20 acres uses Chinese lantern-making techniques to bring its popular displays to life. As you stroll the grounds of Gulf Greyhound Park, you’ll see dinosaurs, depictions of the world’s cities, a fairy tale kingdom and more. Chinese acrobats perform on select evenings and there are multiple family activities as well. On display through January 6, the festival’s doors open at 5 p.m. nightly. Tickets are $22 for adults and $13 for kids. Parking is $5. What happens when you take more than two million lights and create 100 displays? You get immersive family fun, in a walk-through environment that allows revelers to feel part of the show. The annual Sugar Land event also features an array of activities from movie nights to ugly sweater contests. 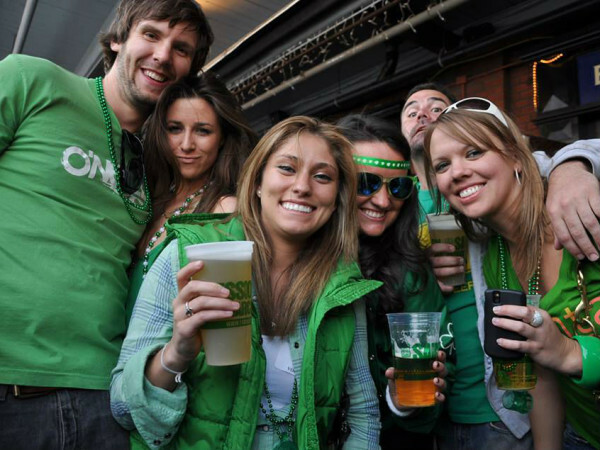 Tickets are $14 for adults and $12 for kids. The display continues through January 1. Six arches illuminate the busy commercial and shopping area hugging the 610 Loop. More than 50,000 lights make up the festive archways, augmented by 300 shimmering blue stars that are adorn pedestrian lights in the area. It took 12 days and a crew of 30 to set up the display. Whether it’s chilly enough to require a coat and gloves, or hot enough to bring out your flip flops, the whole family will love walking through the Winter Wonderland that borders the Ice Rink at Town Center in The Woodlands. The path along Six Pines Drive and Lake Robbins Drive is a festive fantasy land of doves, toy soldiers, elves, angels and snowmen. Strolling through the display is free, but if you want to don your skates and take a turn on the ice, that’ll cost you. Both the rinks and the lights are up until January 21. 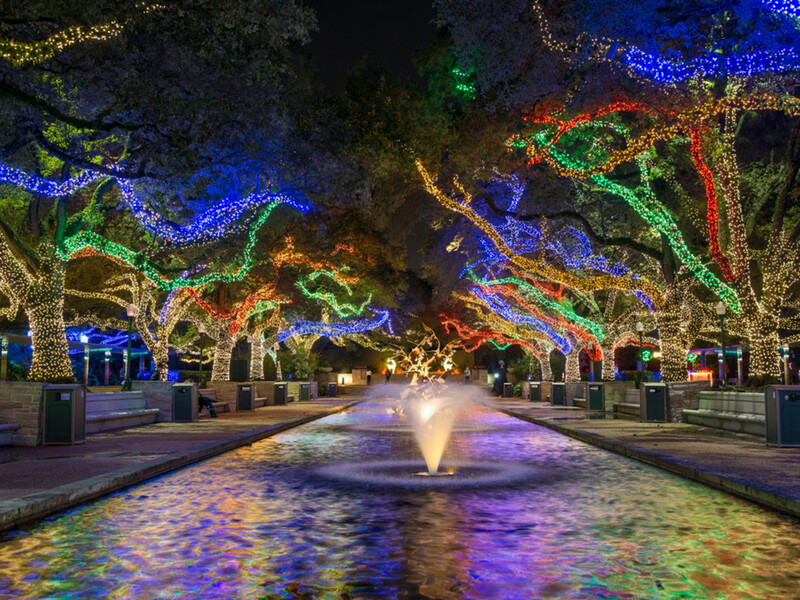 One of Houston’s most popular attractions, this dazzling display is up through January 13. Featuring LED versions of zoo animals (the real ones sleep in the evenings, after all), these animal-themed displays are sure to delight the young and the young at heart. There’s also hot chocolate and a barbecue food truck along the Zoo Lights path. If you like, you can even meet Santa and pose for pictures with him. Tickets start at $17.95 for the general public (Houston Zoo members get them for as low at $12.95). Open daily, beginning at 5:00 p.m.; last entry is at 9:30 p.m.
Every year Bob and Diane Hanley transform their property into a drive-through kaleidoscope of holiday color. 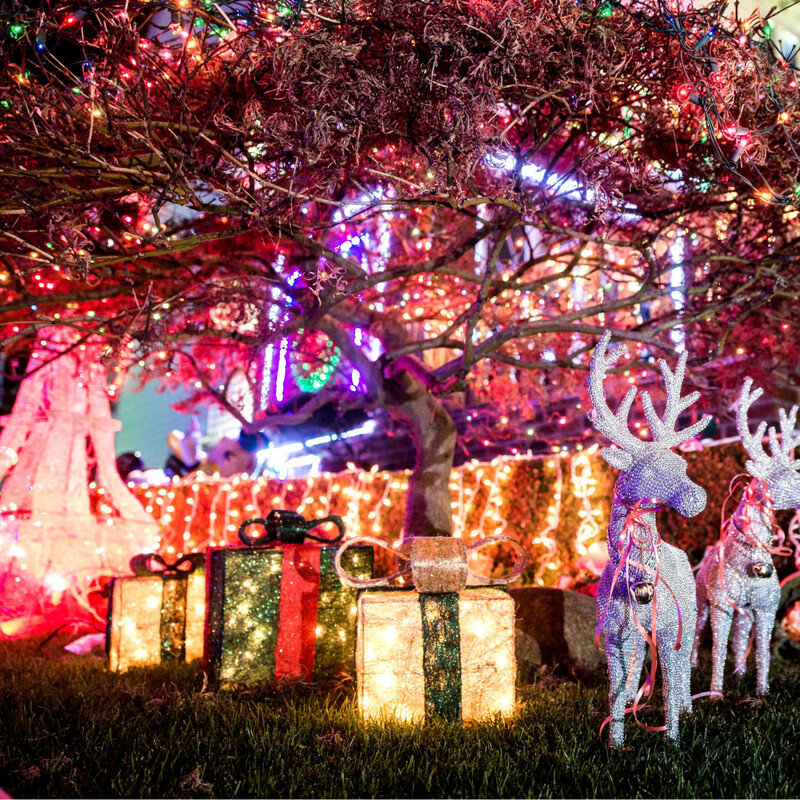 More than 275,000 lights glitter and sparkle, with huge reindeer and Christmas trees dotting the home’s path. Even if you missed the annual Lights in the Heights celebration in the charming Woodland Heights neighborhood, you can still see the Greater Heights historic homes decked in their holiday best. From gingerbread cottages to stately Victorians, the displays here light up homes that evoke a bygone era. 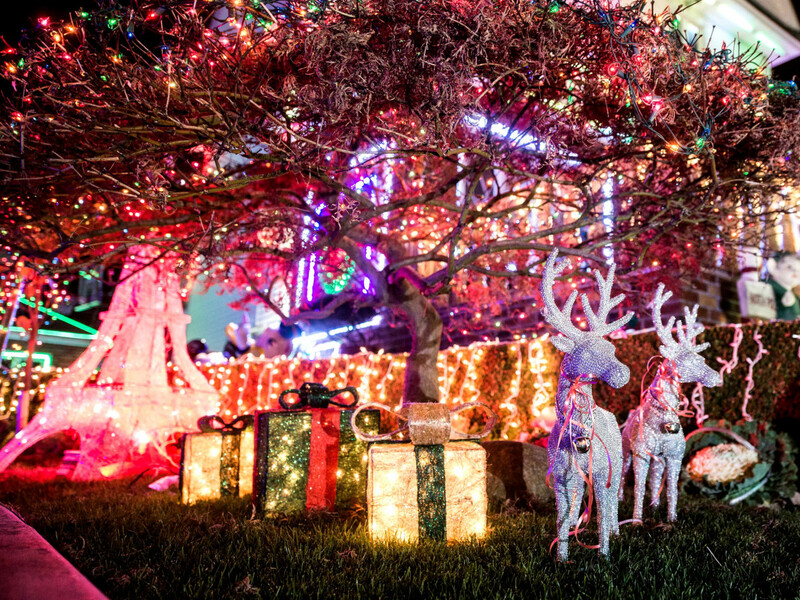 The master planned community in Richmond features an array of decorated homes, with many of the residents competing in the area’s annual Christmas Lighting Contest. Hayrides through the streets to see the displays are offered during certain evenings, adding a festive touch to this popular viewing place. Off Highway 249 north of Willowbrook Mall, this neighborhood is a favorite for holiday light lookers. Hundreds of visitors drive though every Christmas to see how the residents have decked out their homes. 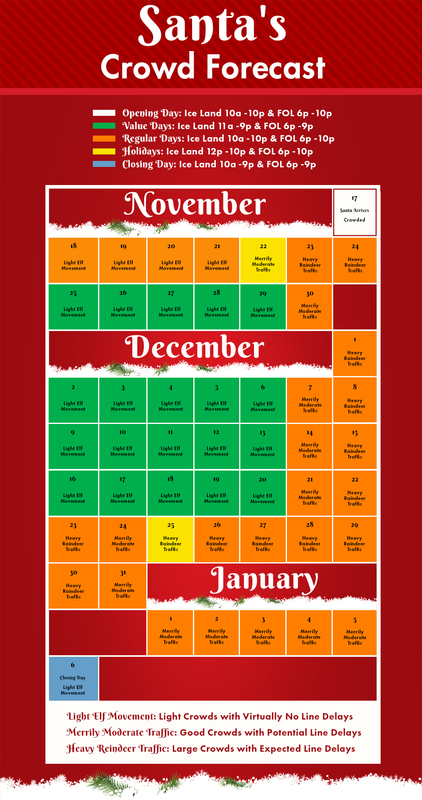 To further get into the spirit of the season, crank up the Christmas music on the car radio. 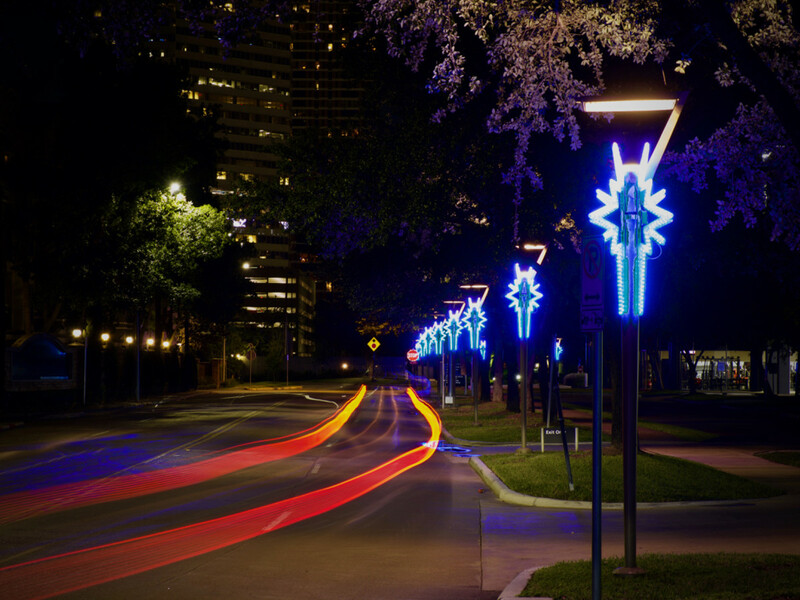 Drive through the wide boulevards and tree-lined streets of Houston’s most impressive neighborhood and you’ll find mansions festooned with lights. They drip from the trees, snake along fences, grow up brick walls and adorn windows and porches. The gorgeously done displays showcase the personalities of the homeowners and evoke a home-grown holiday cheer. The area north of 610 and east of 290 is a cozy enclave where neighbors engage in friendly competition to see who can create the most festive displays. From dioramas in the windows, to eaves and trees festooned with lights and inflatable snowmen and Santas in the front yards, the homemade Christmas displays here are sure to get you in the holiday mood. Pop in north of 43rd Street on either side of Ella and get ready to explore. Much like River Oaks, the stately homes here feature glittering lights that show off holiday cheer. Wide lawns, tall trees, stunning houses – all of them decked out with lights and displays.